I did this walk on Sunday 12th October 2008. 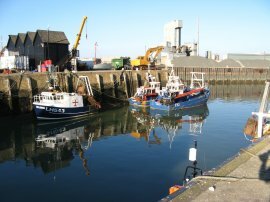 We were almost back to full strength for this walk with seven of us meeting up at Whitstable and Anne and a friend joining us slightly later at Faversham. 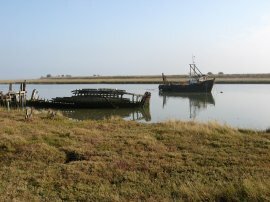 Having parked at Whitstable we then took two of the cars back over to Oare Creek to resume our walk. 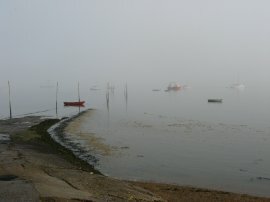 It was another very still and misty morning when we set off from Harty ferry, photo 1, the Isle of Sheppey completely hidden under a blanket of fog. 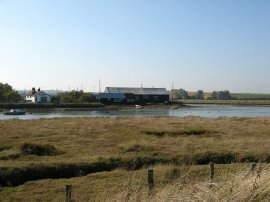 From our parking spot by the nature reserve it was just a very short walk alongside the Swale before the path turns to the right and starts heading up Faversham Creek, photo 2. Near the mouth of the creek we passed another abandoned and rotting boat, photo 3, and we speculated how far we would have walked before we were passing them again when walking down the opposite bank of the creek, my guess was 5 miles. 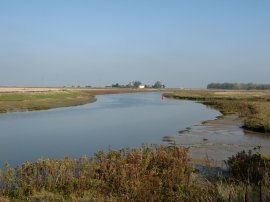 After about half a mile Oare Creek branches off to the right and the Saxon Shore Way follows the edge of this Creek for just over a mile to join a road in the village of Oare. 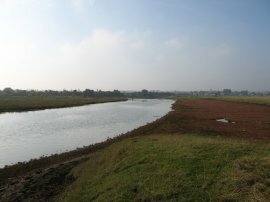 Here the route turns to the left for a short distance before almost immediately turning to the left down a surfaced track that runs down besides the other bank of the Oare Creek. 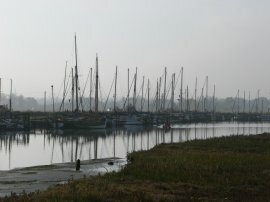 The mist was steadily lifting as we headed down the path passing besides the boatyard in photo 4 which I had photographed earlier when walking up the other side of the creek. Leaving the track the route joins a footpath that runs down towards the end of the creek by another small boatyard and the Shipwright's Arms pub. 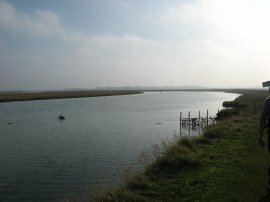 Here the route turns to the right and begins heading back up along Faversham Creek, photo 5, which starts off slightly wider, and is considerably longer than Oare Creek was. 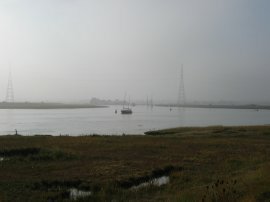 It was high tide and the creek was full of water as we made our way over the flat marshland and farmland besides the creek as it curved round in a big loop towards Faversham, photo 6, the tower of the Parish Church of St. Mary of Charity growing steadily larger through the mist. 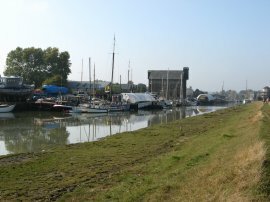 Reaching the outskirts of Faversham the route passes another busy boatyard on the opposite bank of the creek, photo 7, and a little further on the path has to detour briefly inland skirting the edge of a small housing estate built right on the edge of the creek. The route joins a road that turns to head down towards the houses before taking a footpath on the right that leads off to the right, running besides a small area of park, back down to join the edge of the creek. A short distance further on the path joins a road, Front Brents, by the Albion Pub, and at the end of the road turns left to cross over the creek on the suitably named Bridge Road. 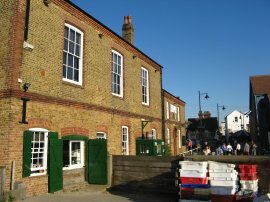 Bridge road is followed as it makes way round to the left passing by the Shepherd Neame Brewery. At the end of the road the route turns to the left and heads down Abbey Street, photo 8. 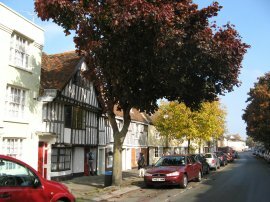 Near the top of the street was a small plaque describing the street as "One of Britains finest Medieval Streets, saved from destruction and restored in 1958". 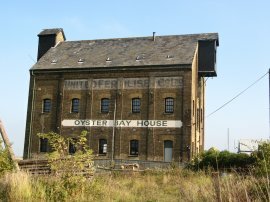 At the end of the street the route turns briefly left into Abbey Road before turning to the right and making its way past a number of old building besides the creek, including the Oyster Bay House, photo 9, which originally started life as a store for hops which were being taken by barge to London. 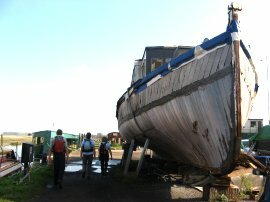 The Saxon Shore Way the heads on through the Iron Wharf Boatyard, which was a hive of activity including a number of boats housed on large barges while they were being restored, before crossing a small white metal bridge and rejoining the footpath along the edge of Faversham Creek, photo 11. A short distance further on we met up with Anne and her friend Mark and we made our back down the creek towards the wide open expanse of Nagden Marshes. Just past Nagden House we stopped for lunch on the grassy flood bank besides the creek, although it was October the day was now bright and sunny with no breeze and considerably warmer than any of the days I had during my weeks holiday in Devon and Cornwall in July and August. Having eaten, and with lovely Zuka paying close attention to any dropped crumbs, we continued our way around the edge of Nagden Marshes alongside Faversham Creek, eventually reaching the confluence of the Faversham and Oare Creeks, photo 12. A little further down the creek we once again passed the boats in photo 3, photo 13. Checking the GPS we found that we had walked almost eight miles since we had passed by them on the opposite bank earlier in the morning which made my five miles seem rather conservative. The area besides the path here was being grazed by some very attractive Konik ponies, photo 14. 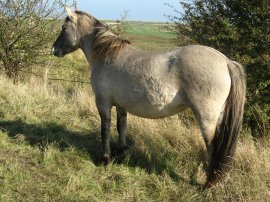 These ponies are a Polish breed of ancient descent, found mainly in the lowland farm areas of Poland, East of the San river, and have been introduced by the Kent Wildlife Trust to help manage the grassland and reed beds. Soon we reached the end of the creek and turned to our right to continue down the coast, once alongside the Swale. 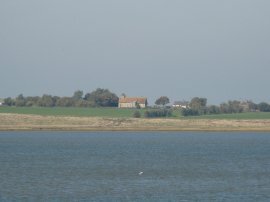 With the early morning mist now long gone the Isle of Sheppey, including the Church of St Thomas the Apostle, photo 15, was in full view across the channel. From here on it was a straight walk along the top of the flood bank towards Seasalter. 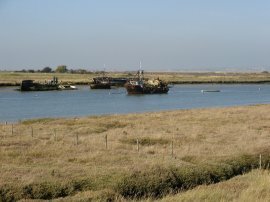 As we headed down the flood bank the Swale steadily grew in width, with the Isle of Sheppey on our left tapering away in the distance towards the light coloured shingle bank that marks the end of the island at Shellness. 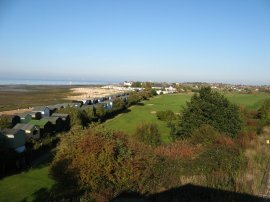 Eventually the route reaches the Sportsman Pub and joins a more raised flood bank besides a road, the path now running alongside Whitstable Bay, photo 16. As we approached the bay the mud that had accompanied the shoreline almost all the way from Gravesend gradually gave to way to ever widening banks of shingle. A little further on we passed a shop where we were able to purchase ice creams. There were a fair number of people on the beach enjoying the good weather and the shop was doing a far better trade in ice creams that they could have probably imagined on an October day. A short distance further on the path joins the road, running between a variety of small bungalows and chalets. 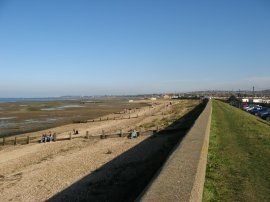 At a bend in the road the Saxon Shore Way then continues ahead along a seafront path. This runs through a private estate before heading uphill to join a road where the route turns right to cross over some railway lines before turning left down the main road. Just past a pub the route takes a footpath on the left that runs downhill towards the railway lines again. 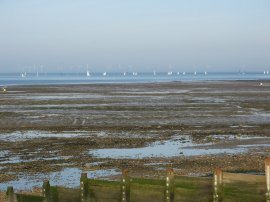 From the top of the hill there were good views out over Whitstable Bay, photo 17, over the mudflats exposed by the low tide, towards a group of sailboats and further out to sea a windfarm, the blades of the turbines hanging almost motionless in the still air. Just before the railway lines the route of the Saxon Shore Way briefly splits into two, one path heading off to the right besides the railway, the other route, which we took, taking a footbridge over the railway lines and then joining a paved path that runs off to the right between a rows of small wooden beach huts, photo 18. Leaving the beach huts the route joins a road and the other branch of the Saxon Shore Way rejoins the route from a path on the right. I have walked both ways in the past and can see no obvious reason for the dual paths on this stretch. A short distance further on we turned to our left and headed down to join the path that runs along the top of the beach. Here we detoured ever so slightly from the official route of the path, which officially heads briefly inland to join the roads Island Wall and a little further on Sea Wall, as we continued along the beach front path all the way to the harbour. The beach front path was packed with people enjoying the unseasonably pleasant weather as we made our way slowly on past the Royal Native Oyster Stores, photo 19. 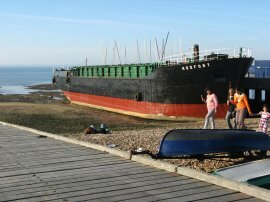 On the beach opposite was a fairly large boat, the Hoofort, photo 20. As we approached the harbour there were a number of stalls and a lively band playing music for the assembled crowd. From the end of the small harbour, photo 21, it was just a short walk across the road to the car park where we had parked at the start of the day. Reaching the car we had walked 15.0 enjoyable miles. Having walked this stage I have now completed all the parts of the path that I had not written up when I had first walked the Saxon Shore Way. This time around I had walked the stages between different points and thus this page overlaps with the next page, (which had been stage 8 last time I did the walk), for part of its length however I thought I would keep the next page as it was originally written hence the slight discontinuity between the two pages.